The hanging gardens of Babylon were one of the seven wonders of the ancient world. Time will tell if the new Babylon restaurant on Edinburgh’s Albert Street makes quite such a splash – if it doesn’t then it won’t be because the menu is too short. I got to over 50 choices on the a la carte before I lost count. 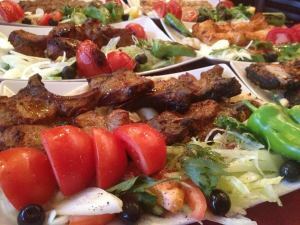 Babylon is billed as a Kurdish and Middle Eastern restaurant with shisha lounge and, at least to my fairly inexperienced eye, its menu seems to cover most of the familiar mezze starters plus a huge array of lamb, chicken and fish grills and stews. The kebabs are cooked over hot charcoal while the nans get all bubbly and crisped in a clay oven. As is usually the case with Middle Eastern restaurants, veggies are very well catered for. Babylon has a wide range of hot and cold veggie starters, including fatoush, alongside veggie skewers, hummus felafels and a selection of okra and aubergine casseroles. The dessert menu reads like poetry. What sort of stony heart wouldn’t feel a little flutter at the thought of rose ice cream? All of the main courses are under a tenner and many are around £8 while the starters hover around £4. A three course taster meal for two is £19.95. They have several different flavoured tobaccos for the shisha pipes and plenty of mint teas, Arabic coffees, fruit juices and yoghurt drinks. You can bring your own booze. Babylon sits about half way down Leith Walk where Assam’s used to be. From Polish delis to Turkish restaurants via taco joints, it’s one of the liveliest areas in Edinburgh for new, if often short-lived, catering ventures. We wish Babylon the best of luck.